The What: KanexPro has announced a new line of NetworkAV over IP extenders supporting the latest resolutions with point–to-point and multi-point to multi-point communications. The Network AV Extenders will debut at DSE 2017 March 29 to 30. 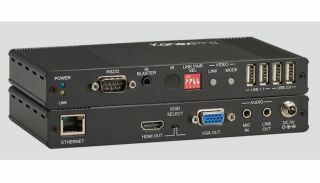 Set for shipping in March 2017, the NetworkAV over IP Extenders from KanexPro provide color critical resolutions, USB KVM support for remote device sharing over IP, and optional compression levels and video formats, including H.264 and MJPEG. • The EXT-AVIPH264TX and EXT-AVIPH264RX use advanced H.264 codec as the compression type, which makes it occupy lower bandwidth and transmit over the LAN more smoothly. It supports 120 meters over single cat-5e/6 cable at point-to-point, as well as multi-point to multi-point over Ethernet switch. The extenders utilize Smart IP Address Setting Dynamic Host Configuration Protocol (DHCP) and wide-band IR pass through to control the source (38khz to 56khz). • The EXT-AVIP120M (Set) and EXT-AVIP120MRX are replacing previous KanexPro models to provide point-to-point and point to multi-point streaming with distances up to 120 meters and fully compliant with HDCP 2.2. The extender set includes EXT-AVIP4KTX – UltraHD 4K/30 AV over IP encoder, EXT-AVIP4KRX – UltraHD 4K/30 AV over IP decoder, EXT-AVIPH264TX - AV over IP 1080p/60 encoder w/ POE, EXT-AVIPH264RX - AV over IP 1080p/60 decoder w/POE, EXT-AVIP120M (Set) – AV over IP 1080p/60 Extender Kit and EXT-AVIP120MRX - AV over IP 1080p/60 extender receiver.